The red emission Nebula called Cygnus Wall is the part of the North America Nebula (NGC7000) that resembles Mexico/Central America. 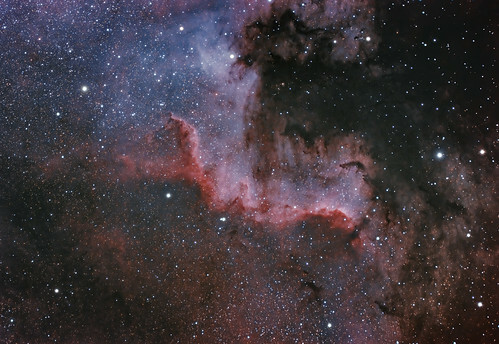 The region is characterized by dark nebulas and dust lanes that give the scenery a dramatic attitude. The image was made with a standard unmodified Pentax K3ii on a TS 130/910 refractor with 0.79x reducer. The blue/ red colors were generated by separating magenta and red in postprocessing and shifting the magenta more and more to light blue. The now blue colors should represent OIII emission regions while the red colors come from Hydrogen alpha emissions. 39 x 300 s exposures @ ISO 200.